Welcome to a world of cutting-edge innovative discovery. TEDxArendal is not only about the talks from our main stage. In our Lounges you can discover innovative ideas, meet inspiring people, relax and read a speaker-recommended book or just take a time out and enjoy the pulsing TEDxArendal atmosphere. Welcome to a world of cutting-edge innovative discovery. 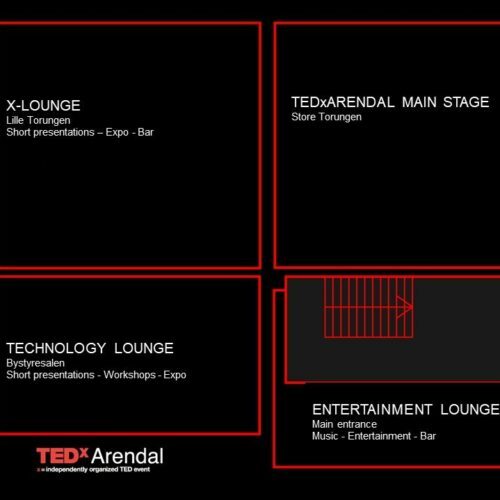 TEDxArendal is not only about the talks from our main stage. In our Lounges you can discover innovative ideas, meet inspiring people, relax and read a speaker-recommended book or just take a time out and enjoy the pulsing TEDxArendal atmosphere.